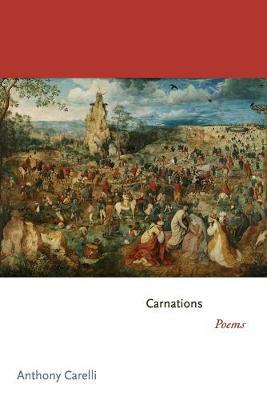 In Anthony Carelli's remarkable debut, Carnations, the poems attempt to reanimate dead metaphors as blossoms: wild and lovely but also fleeting, mortal, and averse to the touch. Here, the poems are carnations, not only flowers, but also body-making words. Nodding to influences as varied as George Herbert, Francis Ponge, Fernando Pessoa, and D. H. Lawrence, Carelli asserts that the poet's materials--words, objects, phenomena--are sacred, wilting in the moment, yet perennially renewed. Often taking titles from a biblical vocabulary, Carnations reminds us that unremarkable places and events--a game of Frisbee in a winter park, workers stacking panes in a glass factory, or the daily opening of a cafe--can, in a blink, be new. A short walk home is briefly transformed into a cathedral, and the work-worn body becomes a dancer, a prophet, a muse. ______ From Carnations: THE PROPHETS Anthony Carelli A river. And if not the river nearby, then a dream of a river. Nothing happens that doesn't happen along a river, however humble the water may be. Take Rowan Creek, the trickle struggling to lug its mirroring across Poynette, wherein, suspended, so gentle and shallow, I learned to walk, bobbing at my father's knees. Later, whenever we tried to meander on our inner tubes, we'd get lodged on the bottom. Seth, remember, no matter how we'd kick and shove off, we'd just get lodged again? At most an afternoon would carry us a hundred feet toward the willows. We'd piss ourselves on purpose just to feel the spirits of our warmth haloing out. And once, two bald men on the footbridge, bowing in the sky, stared down at us without a word.